President Recep Tayyip Erdogan of Turkey is known for intrigues against regional nations, including Iraq, Israel, and Syria, while also imprisoning all and sundry after a failed coup in Turkey. Hence, endless power concentration is in the hands of Erdogan and the dominant political party he governs with an iron fist. However, it seems that challenging President Donald Trump of America is backfiring against Turkey because the spat is leading to enormous economic strains. 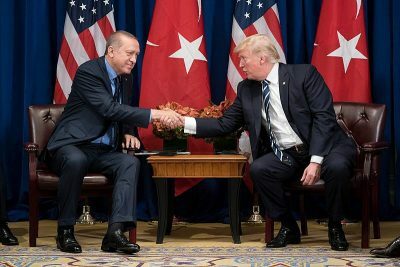 America and Turkey, two NATO allies, are at loggerheads over many issues but the imprisonment of a Christian Pastor is reverberating within the Trump administration in recent times. Yet, while individuals inside the ruling party in Turkey will be alarmed, it remains to be seen if Erdogan will back down immediately – even if he is forced to relent over this issue and other sensitive areas between America and Turkey. However, despite the warning given by the Trump administration, the elites under the authoritarian-leaning Erdogan didn’t listen. Hence, Trump announced increased tariffs on aluminum and steel hailing from Turkey. This, and the political rift between both nations – and, an already weak currency – meant a huge tumble of the Turkish Lira took place. However, it seems that Erdogan will be forced to climb down over the Christian pastor – and bigger issues in relation to ISIS (Islamic State), military deals with the Russian Federation, anti-Kurdish policies in Northern Syria, Israel, the endless imprisonment of individuals in Turkey – and other important areas. If not, then Turkey will have to realign itself while expecting further economic strains. Therefore, it is up to the ruling party to constrain Erdogan because the people of Turkey don’t need to suffer economic pain alongside seeing a political downward spiral based on the authoritarian nature of the current leader of Turkey.